Buddhism in Argentina is well known since the early 1980s.Eventhough this is a country mainly Catholic, Chinese immigrants established the first Chinese temple in 1986. By the same time, Korean inmigrants founded their own temple. 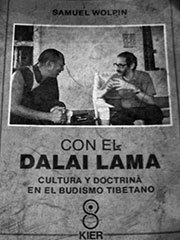 Since then, many groups have been giving teachings, some of them rooted in the most known Soto tradition from Japan, but also many Tibetan institutes for the practice of the meditation (Mahamudra, Dzog Chen, Lam Rim).His Holines The XV Dalai Lama visited Buenos Aires twice. The first time was in 1991 or 1992.Nowadays, many branches have flourished, an increasingly number of practitioners is keeping the Wheel of Dharma turning.Last year, many organizations cooperated to bring the Sacred Relics of the Buddha to Argentina. This event was supported by the Royal Embassy of Thailand in Buenos Aires.There were many scholars who contributed to the spreding of Buddhism in Argentina.One of them is Samuel Wolpin, whose books have opened a door to many students and general public. The others are Carmen Dragonetti and Fernando Tola, two scholars who have been researching and studying on Buddhism for many years, and their books are translated to many languages.But the main source of improvement about the practice is the presence of great teachers who have visited our country. Among them, Pu Hsien, the founder of the Tzon Kuan Temple. So Mok Sunim, the teacher who was responsible for the great spreading of the Korean Buddhism in the last four years. Lama Ngawang Sherab Dorje, who visited Argentina many times and whose great generosity has contributed to the development and nourishment of the practitioners.Among the local teachers, the main are: Augusto Alcalde (Diamond Sangha) the first Roshi in this country. Jorge Bustamante, Soto lineage. Alberto Pulisi (Upasaka). Gonzalo Barreiros (Dharma Teacher), and the two Argentinian Lamas, Horacio and Consuelo.